What is the progress status of the website? Can I find out if a specific commitment has been fulfilled? IIF stands for “Integrated Implementation Framework.” This initiative was proposed by the Secretary-General of the United Nations in order to track financial as well as policy commitments made towards the achievement of the MDGs. Since the 2000 Millennium Conference, Member States have reiterated past commitments in support of the MDGs at different fora. Subsequently, there remains a worrisome lack of clarity regarding the precise nature of many of the commitments made by donors and recipient countries alike, the extent of the delivery of such commitments and the extent of the “additionality” or exclusivity of the commitments. The IIF will raise the visibility of these commitments and increase transparency, making stakeholders more accountable to their commitments. 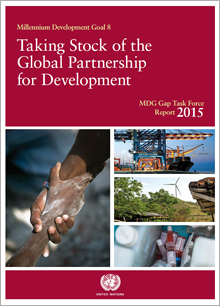 The MDG Gap Task Force is responsible for implementing the IIF. The website is the main instrument of the IIF. It will provide qualitative and quantitative information related to commitments made in support of MDGs and the degree of delivery of these commitments. It is meant to be a tool for all stakeholders, including Member States, the UN system, other international organizations, the private sector, civil society and non-governmental groups and organizations. The website was launched by the Secretary-General at an informal meeting of the General Assembly on 6 June 2012 at 10:00AM in Conference Room 4 (NLB). The website is publicly accessible. If you have any comments and/or suggestions on how to improve the website, please contact us. Commitments are searchable by country, by event or by MDG. Data can also be downloaded and displayed through an interactive map. Users can also follow the latest news on recent commitments and join our blog discussions on various related topics. See above for a brief demonstration of the main features of the website. Go to our main search page where you can filter through all commitments by any combination of country, event, MDG and MDG sub-topic. The search will generate a list of commitments, based on your selection criteria. Each commitment entry then shows some basic information about the commitment, including the countries and partners involved, the commitment itself, its “additionality,” any numerical targets attached to the commitment, as well as the progress and gap in delivering on the commitment, i.e. the extent to which it has been fulfilled. Registered users are able to post comments and their reactions on the commitments, data (including accuracy), news articles and on our discussion blog. If you would like to contribute data and/or information on commitments, please contact us.